Ramblings from the Afternoon Tide: Bueller?.....Bueller?....Bueller? Today a twenty-six year quest comes to a very happy ending. 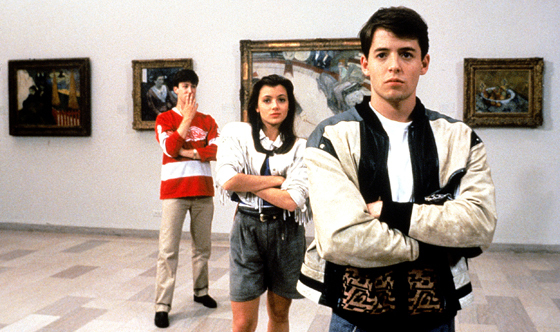 As I type this blog, I am listening to the melodic tones of the Ferris Bueller’s Day Off Soundtrack. This soundtrack has been my elusive one-armed man my whole adult life. The only way this moment could be more complete would be if it was on an actual cassette complete with cool plastic casing and that little paper insert. But, I’m not complaining. Thanks internet! Truthfully, the real thanks should go to my old High School pal. Peter Lee. Pete and I grew up together in the North Georgia Mountains in a sleepy little time I like to refer to as the Awesome 80s. Being the children of transplanted parents who were academics at Young Harris College, this did not win us as many cool points as you’d guess. Most of the adults we knew through High School seemed more concerned with how far you could throw a football or how much sorghum one could cut. 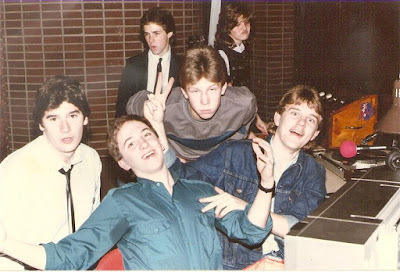 It goes without saying that between Peter being Drum Major and myself President of the Art Club, we were not recognized the cool guys we knew we were. The only skill we got any cool points, and it wasn’t too much, was our little group used to run the sound system for all the high school dances. Peter, Marty Gibby, Brian Patterson, and myself would get together after the Towns County big seasonal game every Friday night and the occasional Saturday and spin some old 45s. I went to Union County so it wasn’t always as easier for my schedule to coincide with them but I go pretty good at synching up. Being a DJ became the high point in a pretty dismal social life. Tracking down the newest/latest musical releases became an art form. Keep in mind this is around 1984-86 and the internet was unheard of. We lived in a series of quant mountain villages with the nearest mall about an hour off. Some of the local guitar shops carried music but it was mostly gospel and country which we despised at this point in our budding musical tastes. Occasionally the Sky City which was the North GA rip off of K-mart, might have something. I did score a copy of U2’s Boy and War there by accident. (I got serious bragging rights in our group of music snobs). Soundtracks were my specialty and something that I was a bit obsessive about and I had a huge collection already at 17. I was trying to explain to Kim this morning that there was something about a John Hughes soundtrack. He had his finger on something that I’ve never seen anyone duplicate on screen. His words and stories were always great but he also understand how the MTV generation also needed an excellent pairing of music to go with his silver screen vision, A John Hughes soundtrack was always a mish mash of classic tunes we all knew combined some choice sound bites of dialogue, and topped with some great current jams featuring that awesome 80s sound. The only other person who comes close is Adam Sandler with his soundtracks. My collection boasted them all: Weird Science, The Breakfast Club, and even Sixteen Candles(which actually got lifted at one of those dances so I need to track that one down as well). Peter and I saw Ferris shortly after graduating. I began my search but to no avail. None of our local stores had even heard of this movie much less special order. I expanded my search to the Turtle Tapes and Records in Oglethorpe Mall during a visit to grandparents in Savannah. I even went into the shadier McCrory’s Record section. No luck! My search led me to begin canvassing the Atlanta market, My poor results continued. Finally, I discovered there never was an US released soundtrack due to licensing issues but there was a foreign import. Foreign imports are the dreaded word to most collectors because it usually means the dealer is going to jack up the price. He did. As much as I wanted my own copy of Ferris Bueller’s Day Off, I just couldn’t bring myself to pay the 80 bucks. Over the next decade or so, I’d occasionally poke around but I never really tried as hard as I did as that summer back in 1986. All that changed this morning. Peter was creative enough to put together an excellent group of MP3s that follows the movie perfectly. As a recovered hoarder, I got to tip my hat to Mr. Lee. It’s not always about the collection so much as the completion which draws to a close for me today. I write the majority of these blogs while sitting here in my chair doing a dialysis treatment. It’s not horrible but it is draining to find ways to kill about three plus hours. Today has been a delight as I’ve listened to this awesome soundtrack. The music just takes me back to a time when my biggest worry in the world was trying to not look silly in front of the pretty girls. (and failing miserably) I spend a lot of time during the day being reminded of teen age Robby through the magic that is High School. Today’s little jaunt down memory lane has been nice in that I actually got to focus on the good things that happened during my formative years instead of the bad moments I should be sharing on a therapist’s couch. I’ve also had that revelational moment where I see how it applies to my life. One of my favorite songs is the Dream Academy’s, “The Edge of Forever.” The song played at the end right before Matthew Broderick has to beat everyone home and he’s leaving Sloane’s house. In the world of a 17 year old with little or no romantic experience, it set the bar for what I thought I’d need to feel to be in love. For the first time in way too long, I listened to the words and understood it was the exact way I feel about Kim when we are together and apart. I practically said even quoted the damn thing without even recognizing how the lyrics were relevant. This makes me smile and tear a bit at the same time. Thanks, John Hughes. I’m not just thanking you because no one makes movies the way you do anymore. I’m not just thanking you because I am totally digging on this soundtrack that I’ve searched for about half my life. I’m thanking you because you were able to create a movie that enthralled a 17 year old version of myself yet still I find it relevant as a man in his 40s. Found this post by means of the Turtle records shirt.